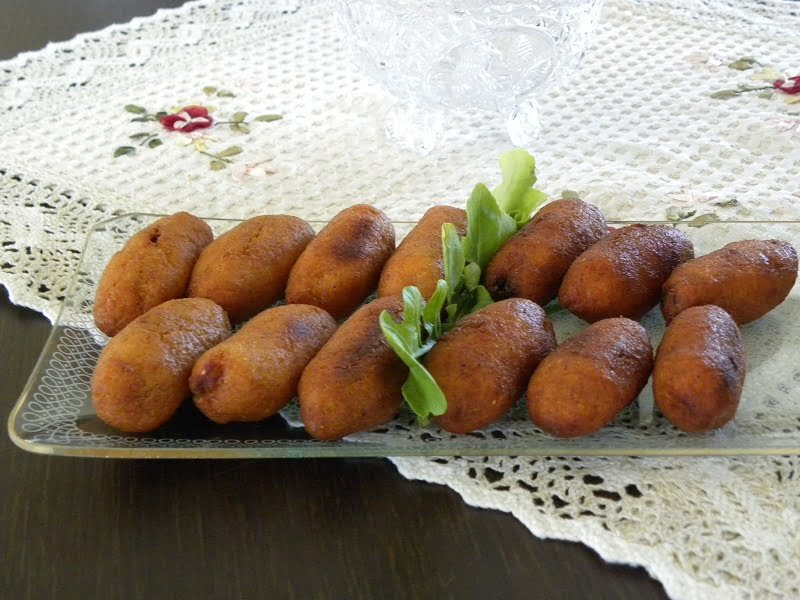 Koupes with Mushrooms is a snack we love eating in Cyprus, during the fasting period. These are available in most bakeries but you can also buy them frozen in the supermarkets. I have posted about koupes last month and you can see the original recipe here. During the fasting period I make koupes nistisimes (vegan) either adding mushrooms in the filling or olives. The shell is the same as the others but without the eggs. When kneading the dough, more water has to be added. The filling is again the same but just substitute the minced meat with pleurotus (oyster) mushrooms, which have a meaty texture but any other kind of mushrooms will also do. If you like rosemary, the combination of mushrooms, onions and rosemary is amazing. However, 1 small sprig of finely chopped fresh rosemary, (only the leaves), is enough to add flavour to the mushrooms. Add it just after sautéing the mushrooms. Some pinenuts can also be included in the filling. One day I also made them with olives. Again the same combination, olives, onions, parsley and spices. Here, I also added some fresh mint. Mix the bulgur wheat and flour with the oil and salt, then add hot water and leave it to soak for an hour. When it has cooled, knead it well until it sticks together, adding some more water. See detailed instructions in the other recipe. Wipe the mushrooms with kitchen paper (do not wash them) and cut them into small pieces. Add the mushrooms and sauté for 5 minutes. Add the parsley and all the spices and mix. Remove from the heat and mix in the pine nuts and olives. Set aside to cool down. Continue as with the other recipe. Same as in Koupes with Minced Meat (half amount). I love mushrooms and I’m so glad that fresh mushrooms are now more readily available in Greece. Koupe-pe koupe-pe to fai mas erhetai… Fresh mushrooms are quite expensive but what the heck, once in a while we can do some extravagances. Thanks for commenting and I am glad that your technical problem will be solved soon. We are all learning from each other and I am so glad I have met people like you. I am looking forward to seeing your new posts. BTW my eldest son is in Sydney since Monday and he says it’s a fantastic place and so cheap. I have never had these, they look great! It is so nice to have such wonderful bloggers of Greek food! I am learning so much MORE about my favorite cuisine! Jenn, blogging is wonderful, we really learn a lot from each other. Very beautiful and they look extremely tasty. Sounds like you’ve got the technique down! I think I was right the other time writing how I managed to learn the technique. If you get correct instructions it’s easy to make things. Before that I used to think that making koupes was the most difficult thing to do. Ivy, this is such a healthy snack, it really is. Thanks for sharing it with us. i’ve definitely got to try these. they look delicious. Thanks Cynthia. I can’t really say if they are healthy but I know they are really delicious. Maria, if you can find fine bulgur wheat do try them, they are fantastic. Fabulous, they look incredibly tasty, thanks for sharing! I love bulgur and these look delicious!